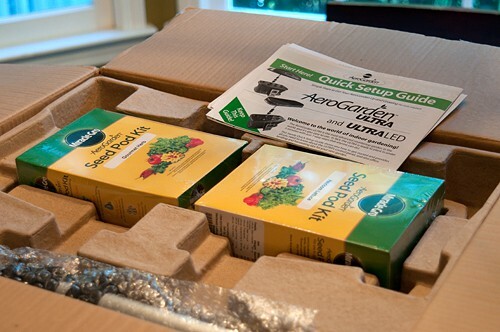 Home » Archives » The Miracle-Gro AeroGarden by AeroGrow Makes Year Round Gardening Easy and Fun! 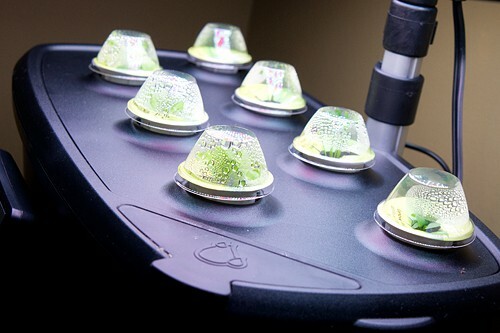 The Miracle-Gro AeroGarden by AeroGrow Makes Year Round Gardening Easy and Fun! This post is sponsored by AeroGarden via the Kitchen PLAY network. All opinions are my own. I’ve been a gardener for as long as I can remember. Even when I was a tiny tot, my parents planted a big garden each spring. We lived on a farm so we had all the room we needed to plant everything from peas to beans and squash to corn. You name it and we grew it. I spent many hot summer afternoons picking whatever was ripe from the garden and enjoying it on the supper table in the evening. These days, however, I have very limited space on my little half-acre suburban lot but we always find room for my annual herb garden along with a few tomatoes and peppers. Besides limited space, there’s also the problem of the local deer who think I grow plants for their own personal smorgasbord. Still, no matter the challenges I’m always sad when gardening season ends. Having fresh vegetables and herbs right outside my back door is such a pleasure. That’s why I was so pleased to be offered an opportunity recently to try the Miracle-Gro AeroGarden UTLTRA LED by AeroGrow. 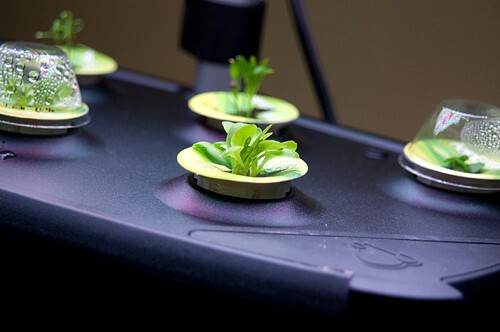 The AeroGarden makes having fresh produce year round very easy. 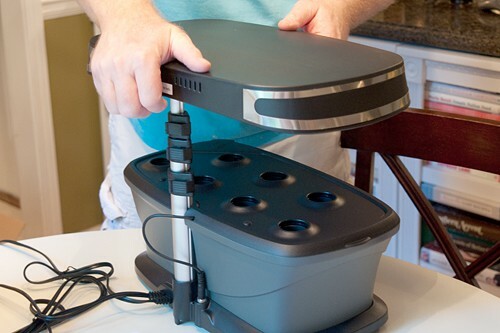 Setting up the AeroGarden was literally a “snap.” It comes in three large pieces that simply snap together. Attach the cords, plug it in and you’re ready to go. From opening the box to plugging the unit into the wall took no more than 15 minutes. You just insert your pre-seeded pods into the AeroGarden, fill it with water and give it a measured amount of the specially formulated Liquid Nutrients which are also included. Switch the unit on and follow the instructions on the digital display. The AeroGarden tells you when to add more nutrients and even gives you growing hints on its display. Our seeds germinated in just a couple of days and within a week or so they were large enough to remove the protective domes. I would say that within the next 3 or 4 weeks, we’ll be enjoying lots of fresh salads and I’ll be using fresh herbs in my recipes. The AeroGarden would be a terrific gift for any gardener whether they’re a beginner or experienced. The AeroGarden 3SL will be available at Walmart.com beginning around November 1 and at select Walmart stores beginning around November 14. The AeroGarden ULTRA LED is currently available at Costco.com and will be available in select Costco Warehouses beginning about November 1. You can also see the entire line of AeroGardens by clicking here. Absolutely love my AeroGarden. So wonderful to have fresh herbs all year long. I think this year I’m going to focus on that little lemon tree but I will be watching very closely! My dad bought one last year and had a bunch of perfectly delicious soft butter lettuce! I’ve always eyed those aerogardens. It’s good to hear that they work so well! I’ve always wanted an aerogarden! It looks awesome! I was never good at gardening, but this is awesome! I want to do this! 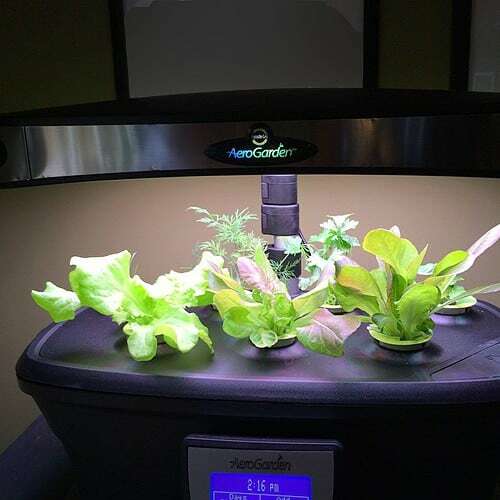 I love my AeroGarden – fresh herbs in the middle of winter is the best! I love this contraption and will be checking it out at Walmart. Fresh herbs are my biggest need. I know a few people who have these and absolutely love them. Guess I need to hop on the aerogarden bandwagon! Do you need to put the garden by a wondow, or do you use a grow-light? Angela, they recommend not putting it in direct light. It has its own built-in grow lights! Perfect for people with a low-light indoor situation. Ive always wanted to try one of these. Now I can see how easy it is. On to Target, I go! I’m so jealous you got this campaign! I have zero yard and have been dying to grow some of my own goodies. So neat! I need one of these. Our winter season lasts way too long. I’ve thought about getting one of these. It looks so neat! I’m the gardening black widow. No, really – I am. Mostly because I forget the cardinal rule: All living things need water. I’m going to try the AeroGarden. It would be nice having herbs year round. And maybe they’ll survive. Who knows? Angela – the display on the AeroGarden even tells you when you need to add water! There’s really no guess work at all. I have always wanted one of these. I love the idea of having herbs all year long! I have been meaning to buy an AeroGarden and just haven’t! What am I waiting for?!? I love it! I have always wanted one of these. They are so cool. Hmmm, I’m killing all my herbs indoors so maybe I should give this a try! We live in the woods which, while beautiful, means that we get approximately zero natural light in the house. An AeroGarden looks like so much fun! This is awesome! I have always wanted one of these.